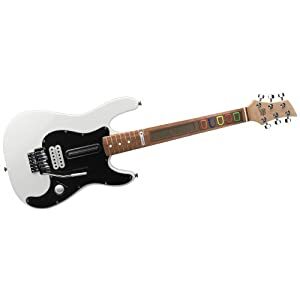 With the incredible popularity of games like Rock Band and Guitar Hero for Wii, a ton of different Wii guitar accessories have flooded the market. Some of them just help you look cool, while others can actually enhance game play or allow you to jam with more people. Let’s take a look at some in each of these categories so you can figure out what you need to keep rockin’! Wii guitar face plates are the most common aesthetic accessory. They are essentially high quality vinyl stickers that are cut in the shape to fit around all of the buttons and knobs on the Wii guitar. You can get ones that match the axe that your favorite guitarist plays, like Eddie Van Halen or Zakk Wylde, or just get a really cool design. Most of these will only work with the standard Les Paul-style guitar that comes with Guitar Hero, but more designs are frequently hitting the market. Another great way to improve the appearance of your axe is to swap out the strap. Any guitar strap will work, but there are some that are created specifically for your Wii guitar. You can get straps that have the logo of rock legends Kiss, or something that suits your personality better, like flames or hearts. For something more functional, or to add a new guitar to the kit, check out the Logitech Wii Wireless Guitar Controller. Rather than feeling like plastic video game guitar, this feels like you’re playing the real thing. It feel like a real guitar, because it is! It’s made from real wood, with a rosewood fingerboard, and actual metal frets. Obviously, this guitar costs a bit more than other Nintendo Wii accessories, but it provides a feeling of authenticity like no other one can. If you just want a second guitar, there are a lot of other manufacturers that are turning them out. Activision (Guitar Hero) and MTV Games (Rock Band) make the official guitars for the games, but any of the other ones will work just fine. You can also save quite a bit of money by shopping with the third party companies. Adding Wii guitar accessories isn’t mandatory, but in order to get the most from games like Guitar Hero or Rock Band, they certainly come in handy. Having to sit around watching other people play is no fun at all, get the extra gear so everyone can get in the game!